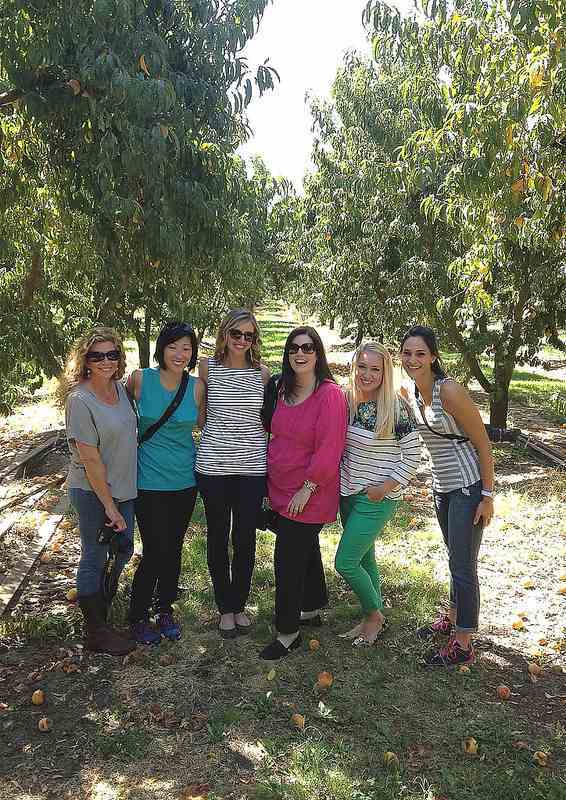 A couple of weeks ago, I had an opportunity to spend a day out in Modesto, California with these lovely ladies (L to R: Kelley, Julie, Ali, Robyn, Jenny and me) as we visited one of Del Monte’s canneries and a peach and tomato farm nearby that grow for them. It was an eye-opening experience on many levels. 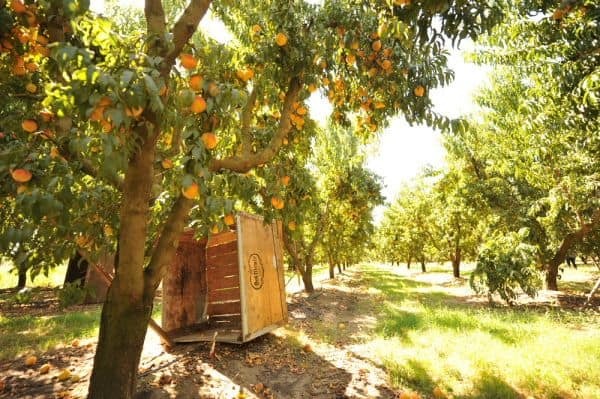 From learning that 90% of Del Monte’s fruit and vegetables are grown here in the U.S. (and 100% of the canned peaches and tomatoes), to the ins and outs of the harvesting process, to the hundreds, actually it’s probably more like thousands of specific steps it takes to get a peach from the farm once harvested into a can and on your store’s shelf. We started the day off with some snazzy hair nets and a tour of the peach cannery. To say that it’s large would be the understatement of the year. It.is.massive. With multiple buildings and machinery so specific you seriously wonder who on this planet was able to come up with the engineering behind it, we were awed at every turn by the workings of this facility. And while there is machine after impressive machine and such diligent attention to detail from the employees that obviously make a company as large as Del Monte able to supply the entire United States with it’s canned fruits and vegetables, the thing that surprised me the most was the “realness” of this whole operation. What do I mean by “realness”? When you’re walking down the aisle of your grocery store and you see that can of Del Monte diced tomatoes that’s on your shopping list, there’s this sense of detachment, right? You can’t even really fathom where those tomatoes might have come from. You just know you need diced tomatoes and in your cart they go. The cool thing about this trip was seeing the cartons full of produce fresh off the harvesting truck, the majority of which get packed the same day, and then later in the day actually visiting one of those farms, meeting that farm family that grows those peaches or tomatoes and putting the whole process together in your mind. 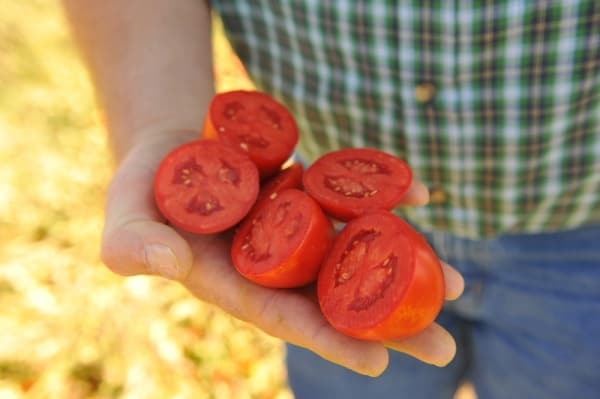 It’s not some mysterious can of tomatoes on the store shelf anymore, it’s a family with a farm in California making a living like they’ve been doing for 3 or more generations and producing products that eventually make their way into our home pantries and onto our dinner tables. Personally, when I buy the canned fruit I buy the kind packed in fruit juice, not syrup. 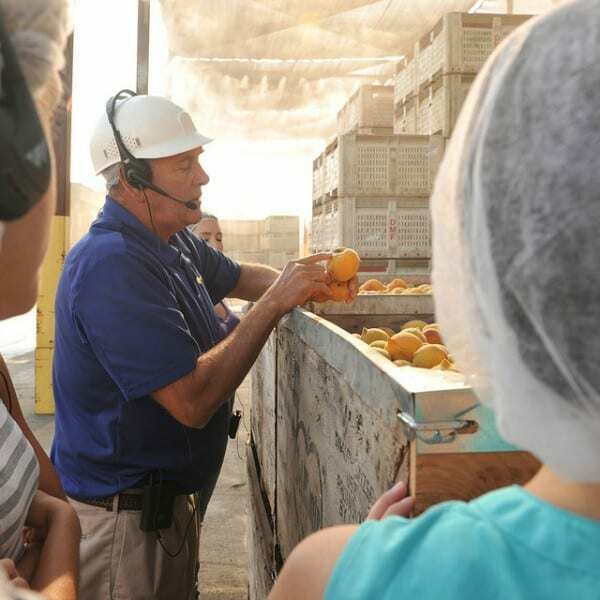 One of the cool things we learned on the factory tour was that fruit juice they use for packing comes from the fruit that didn’t meet their standards in regards to color or size, keeping the wasted fruit to a minimum in the whole process. 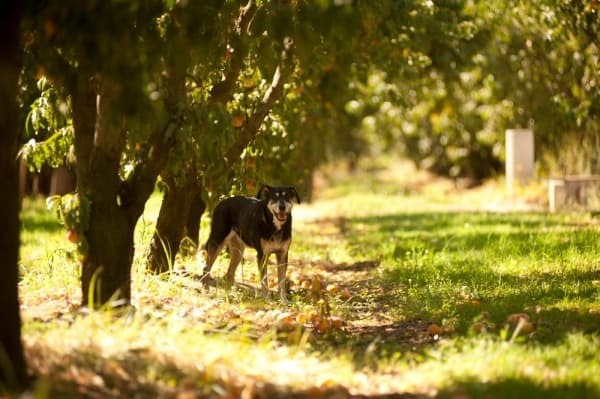 After the factory, we headed 10 minutes down the road to one of the peach farms Del Monte partners with and met the two brothers (and Cosmo the orchard dog!) who have been working on this farm since they were kids. 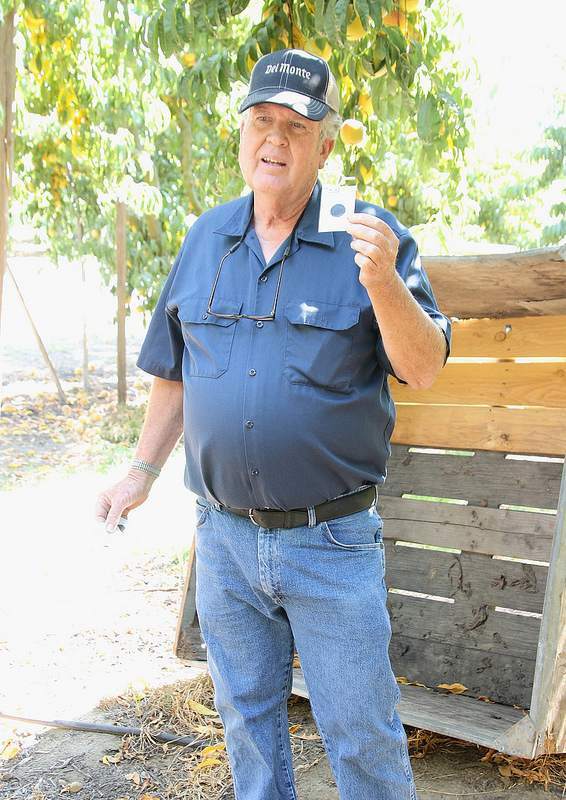 We listened to them talk about the history of peach farming, how they maintain the trees, how they use pheromones to help protect against certain insects and the harvesting process (which was going to take place about a week after our visit). Cosmo got a lot of love and we enjoyed a few fuzzy peaches straight off the trees. 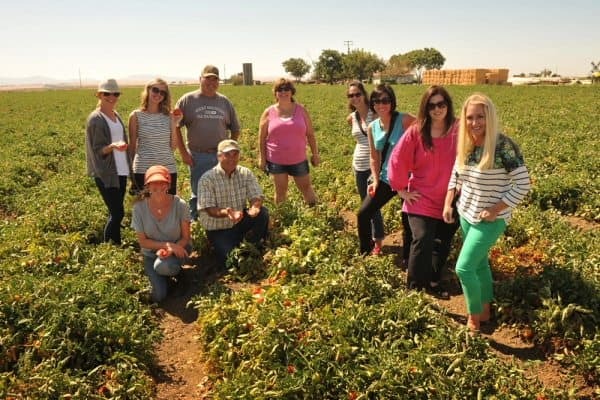 After a delicious lunch of everything from salads to spare ribs to peach cobbler we headed out to a tomato farm about an hour away to check out how that harvesting process works. The Pereira family who owns the tomato farm, was so incredibly nice, literally giving us bags to fill up and take tomatoes home with us (which I took full advantage of!). These tomatoes were only a couple of days away from being harvested and were sweet as could be out in the full California sun. It was absolutely nuts to pull back the tomato vines that hugged the ground on this Roma variety and see the hundreds of tomatoes underneath! So.many.tomatoes! 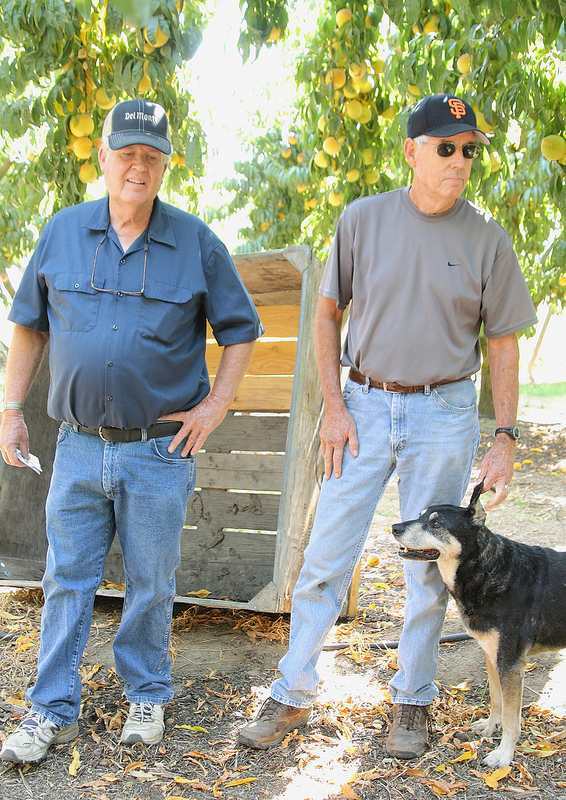 The Pereira’s own over 900 acres of farm land and grow a variety of things on their land, but tomatoes are their most profitable crop and therefore the one they “worry” about the most. The threat of rain the week before we were (which isn’t normal for that part of California this time of year) there had the family very stressed out for a day or so. We saw the difference between a drip irrigation field and a flood irrigated field and then even got to see a harvesting machine in action. I think a lot of people (myself included in the past) have this “not as good for you” mentality when it comes to canned produce versus fresh. 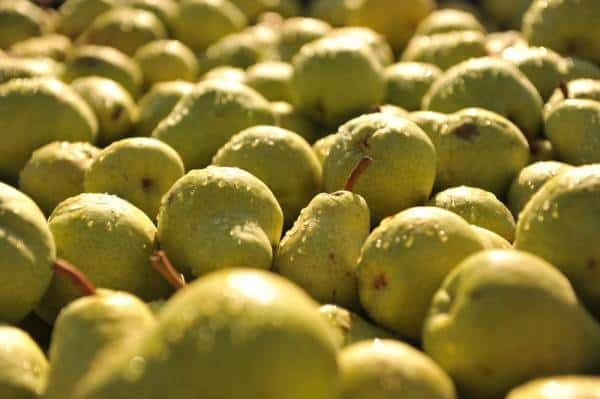 The reality of that however, is that canned fruits and veggies in the store can be just as good for you as if you were to do the canning at home in your kitchen. 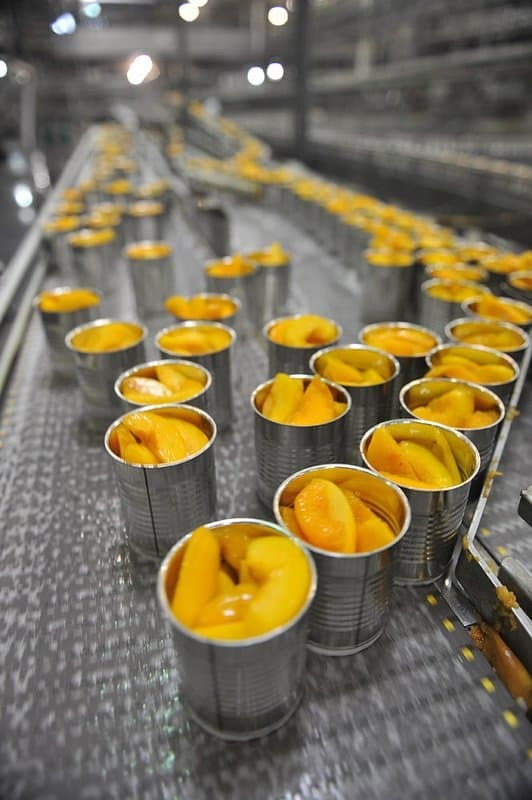 The nutrient profile of canned produce, we learned, is actually very similar to fresh and in some fruits & vegetables, canned versions are even higher in antioxidants and vitamins as a result of the canning process itself. Knowing where my food is coming from is something that’s pretty important to me. It’s obviously easy to feel comfortable with fresh, local produce and I’m so happy I can feel the same about the fruits & vegetables I buy in the Del Monte can now too after this trip. 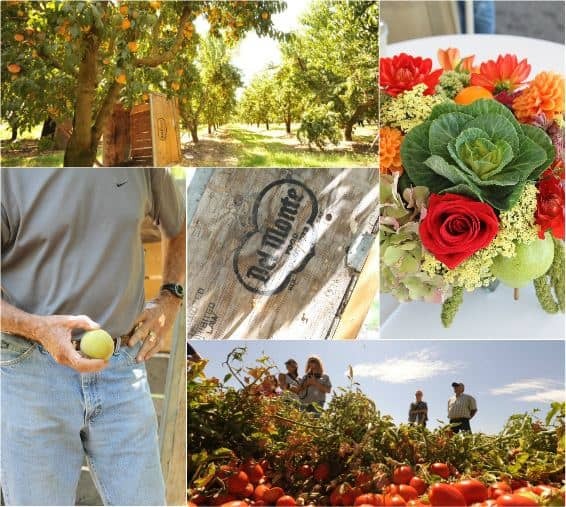 I can’t thank the farmers who opened up their livelihoods to us and Del Monte who let us get a peek behind the scenes enough for this great opportunity. 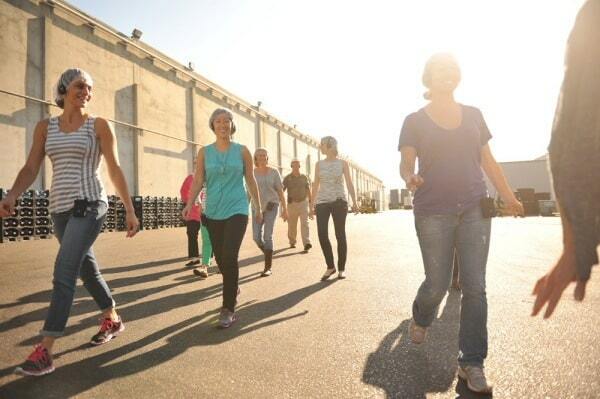 *This trip was hosted by Del Monte & Blogher. I’m being compensated for my time but as always, opinions and content are my own. My favorite peach recipe is peach ice cream. Love peach crostada! It looks like you all had a great trip! peach blueberry crisp, you can’t go wrong! My favorite tomato recipe is something my Mother shared with me to make a tomato and ham pie, its such a nice winter meal. My favorite peach recipe is peach cobbler scones. 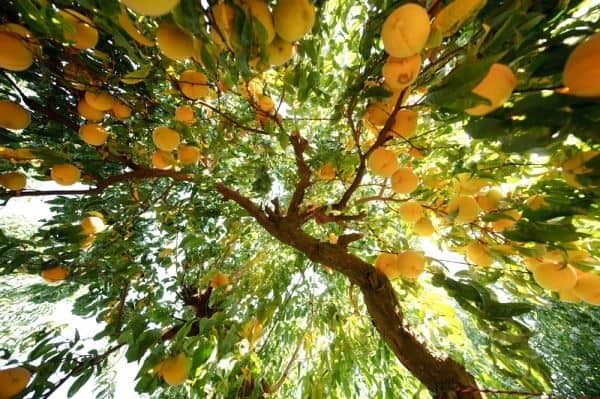 I am loving these photographs – the sunlight is hitting the fruit perfectly!! Peach cobbler is my favorite peach recipe! My favorite peach recipe is peach pie!!!!! 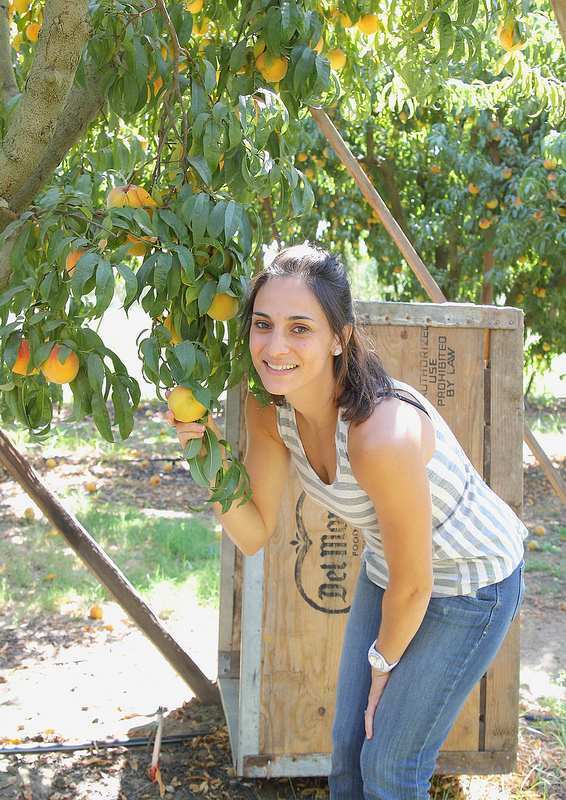 I’ll make it all year, but the best time is when peaches are ripe and juicy! I make a pretty lattice crust with butter and fill it to the brim with peaches and a little light bown sugar, dot with a little butter. Yumm! It is so good I must say so myself, and very pretty. I love Del Monte peaches AND canned tomato products. I usually eat their peaches in a bowl with some cream or milk and I use their tomatoes for everything! I never had access to fresh peaches like I do now, so I don’t really know how to cook/bake them. I’ve only had them fresh or grilled. One recipe I like using stewed tomatoes is to cook them with onions and SPAM. Yes, SPAM. My favorite peach recipe is a peach cobbler with a cinnamon crumb topping and vanilla bean ice cream. My favorite recipe for tomatoes is BBQ chicken with tomato bruschetta smothering it! Yum! Favorite tomato recipe is Chana Masala! Great post! Looks like you had a great time. My favorite peach recipe is grilled peach salsa. Peach pie with vanilla ice cream…yum! My favorite peach recipe is Peach Crumb Bars and my favorite tomato recipes are homemade spaghetti sauce, marinara, and salsa!! My favorite peach recipe is Peach Crisp. Knowing where my food comes from is very important to me too. I just came from Mountain Mama Cooks and have been reading all of your recounts from the trip. I actually live in Monterey, so I love hearing about all these places close by. It is so good to know how Del Monte takes care in their product. I have always though canned foods were not as good as fresh. It is good to know that is not always the case. I like to make tomato sauce from fresh tomatoes. It takes a long time, but worth it. And it makes the house smell good! I absolutely love peach cobbler. I make chili with canned tomatoes all of the time! I make a very tasty peach mango salsa. Tomato, basil, and goat cheese sandwich – yum! Oven-dried tomatoes – tastes like sun-dried tomatoes, only it takes less time! My favorite peach recipe is Maple Bourbon Peach butter. Its amazing on biscuits, toast, pork, and ice cream! I have recently heard most cans are lined with a plastic that contains BPA. Are Del Monte’s cans BPA free? If so you have a winner of a product but if not I wouldn’t consume regularly. Right now I’m obsessed with caprese salad with all of the tomatoes in the grocery store! I love making scalloped tomatoes! What a fun trip. It was nice to read more about Del Monte. I like their products. My favorite recipe is homemade peach pie with fresh peaches from the local orchard. My sis makes the filling and I’m in charge of the crust. Yum! Definitely my favorite peach recipe would have to be my family’s favorite peach cobbler. Fresh peaches, simple batter, and butter melted in the pan you bake the cobbler in! So simple and so yummy! My favorite is a simple peach crisp! My favorite tomato recipe is to make fresh pico de gallo for myself. I’ll eat it on EVERYTHING. Well, not ice creaem. There is nothing that brings more joy than a perfectly ripe tomato, sliced & sprinkled with some kosher salt and just a bit of good olive oil & a hit of lemon juice….pure joy! I love homemade peach jam! I love peach hand pies! I like to grill peaches and put on top of pound cake with balsamic vinaigrette. You can use Angel Food cake to lighten it up or just eat the peaches. For tomatoes – gazpacho!! My moms peach ice cream…all homemade…is my favorite. As for tomatoes, we like to roast them in the oven on low heat for hours on end and then mash them in with polenta and cheeses and fresh basil. So delicious and gluten free. peaches topped w/ frozen yogurt and some homemade granola. I love making spaghetti sauce for spaghetti and meatballs with tomatoes. My favorite way to have peaches is to roast or grill them, slice them up, and serve over a bed of arugula, cottage cheese and marcona almonds. Figs are always a nice addition as well. So good for a quick summer meal! My favorite thing to do with peaches is cook them with a simple syrup and serve with vanilla yogurt, ice cream, or even sour cream for dessert. I love to make braciole simmered in a tomato sauce. A rustic peach galette — so good!!! My hubby is the cook in the family and he makes the BEST homemade salsa using fresh tomatoes (and other veggies) and the cilantro and other herbs he grows in a container. My dad makes the most outrageous peach cobbler ever. He grew up in and we still live near Pageland, SC which is well-known around here for their peaches. Hope he will pass on the recipe to my hubby, but for now it is a guarded “family secret” recipe. I love to make (and eat) peach butter, so delicious! What a wonderful experience and love your pictures. I feel like I’m there soaking in the sun too. :) My favorite peach recipe is a fresh ginger and peach crisp. Perfect this time of the year. peach pound cake. It’s sooo good and everyone loves it. My favorite tomato recipe is my spaghetti and my favorite peach is my mother in law’s peach cobbler!! Homemade peach ice cream is a favorite. my fav tomato receipe is tomato and basil paninis… they are to die for!!! Fresh tomatoes in salsa is one of my favorites. I love making my homemade chili recipe with tomatos. I love peach anything but peach ice-cream is my favorite. I think canned peaches were made for Peach Cobbler, my favorite recipe for peaches. I love using fresh tomatoes in my homemade lasagna. Nothing makes the sauces taste more alive. I love making peach shortcake! i love peach cobbler recipe best! I like to make tomato sauce. I love a good peach cobbler. A good tomato soup with a grilled cheese is always good. I love to make tomato pie with peppers and cheese! I love anything with peaches and caramel and as far as tomatoes go, I LOVE a good BLT!